Last Christmas (note that it is currently October) I impulse-purchased a Groupon gift for my in-laws, the very people who don't even crack open their Entertainment Book. 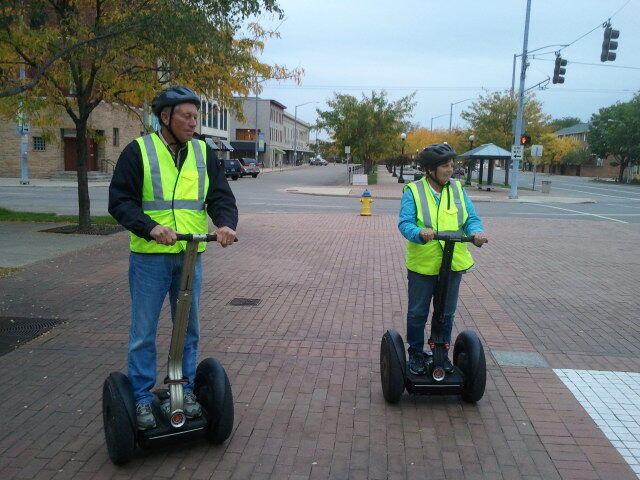 Yes, last year I bought my class-reunion-in-the-nursing-home going in-laws a Groupon for a Segway tour of Dayton. 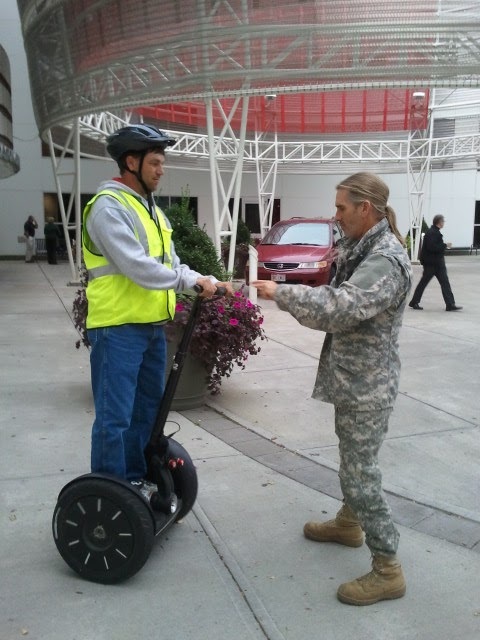 After we recovered from the county fair this year, they finally called to book their tour and were actually looking forward to riding Segways. So they drove all the way to downtown Dayton and avoided being mugged or murdered, just in time to get stood up by the guy who was supposed to give them the tour. 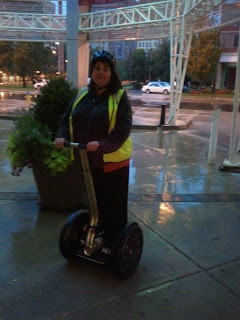 Fortunately, Dayton Segway Tours made good on the Groupon AND provided two more tickets, so Husband and I got to go with them. The kids stayed behind but Morgan did manage to tell everyone at school that we were going on a subway tour. Did I mention that it started raining when we were a very long and bumpy sidewalk away from our car? This did not phase our affable, camo-wearing, pony-tailed guide. But it does help explain, I hope, this damp, not-smiling-because-GOD-Husband-can't-operate-any-digital-device photo of me at the conclusion of our ride. So here are my in-laws, looking every bit the Fidelity retirement commercial. They ended up enjoying it so much (rain and all) that I am already thinking about their next Groupon gift. Oh Holly! You crack me up as usual! !